Physics Buzz: Is Ball Lightning Just A Trick of the Mind? Everyone seemed to enjoy the Mathlete's sassy take on lasers yesterday, which included a rewrite of a Britney Spears song and an attached video with lots of bare midriff. Is that what I have to do to win your hearts?! Well, I'm afraid I just don't have the Mathlete's poetic graces or Britney's trainer, so you'll have to make do with my inane yet informative ramblings. I am especially excited about today's topic - ball lightning - although I wish I were able to report that the mystery of this unconfirmed phenomenon had been solved. Alas it has not, and in fact, the story has taken a dramatic twist. New findings published in Physical Review A suggest they may simply be due to the magnetic field interaction with our brains. There are a handful of articles out there on this new paper, including a great one in New Scientist by Kate McAlpine, also known as Alpinekat. Let me back up. Ball lightning may or may not exist, and different reports of ball lightning may actually be observations of different phenomena. 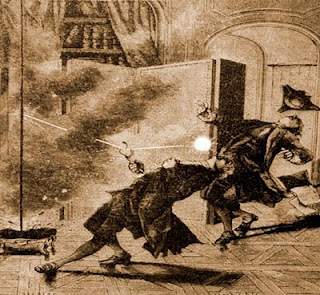 Ball lightning was first reported in 1634 during a great big storm in England. Townsfolk reported having seen an 8-foot fireball burst from a bolt of lightning and destroy a church. The destruction was very real, and four people were killed. In 1960, a survey found that about 5% of the American population reported having seen ball lightning, varying in size from a few centimeters to many meters. There are photos which seem to show ball lightning, but none that have been strictly confirmed as evidence of the phenomenon. The accounts of ball lightning are varied at best, though there are instances where multiple observers have seen the same ball lightning and given agreeing descriptions. The physical evidence for ball lightning is mixed - in Sweden a ball lightning allegedly went through a window, cutting out a 5 cm in diameter circle in the glass. Other than property destruction, which could also be caused by a lightning bolt, there isn't much to go on. Scientific experiments have produced visually similar effects in the laboratory, but no one can yet confirm if these experiments are related to or can explain ball lightning. There are multiple theories about what might cause ball lightning, including the notion that they could be black holes. "The experiment may confirm the hypothesis that ball lightning forms when normal lightning vaporizes silicon out [of] soil, wood, metals or plastics. Theoretically, the vaporized silicon forms a cloud of nanometer-sized particles that glows as it oxidizes in the atmosphere." That paper was published in Physical Review Letters, and now a new paper in Physical Review A says ball lightning may actually be a trick of the mind. Specifically, someone standing within a few hundred feet of a very specific type of lightning, which generates a specific strength and duration of magnetic field, may experience a mental stimulation similar to that given in electrode therapy. The stimulation may cause hallucinations, which could result in someone thinking they saw a ball of lightning. Does this mean ball lightning is just a hallucination? Remember that there is speculation that not all reports of ball lightning are actually the same thing. Some of them may be hallucinations, while others might be the phenomenon reported in 2007 in PRL. However, he [Kammer] doubts that sightings of ball lightning lasting longer than a few seconds can be explained by TMS hallucinations, since even repetitive return strokes don't last very long. What's more, the serious burns and deaths attributed to ball lightning need a material explanation. Now the paper isn't a neurological study; what is confirms is that certain types of lightning do create magnetic fields similar to those used in neurological stimulation, and which are known to induce hallucinations. So rather than confirm or deny the existence of ball lightning, scientists could be getting closer to separating out different phenomena.